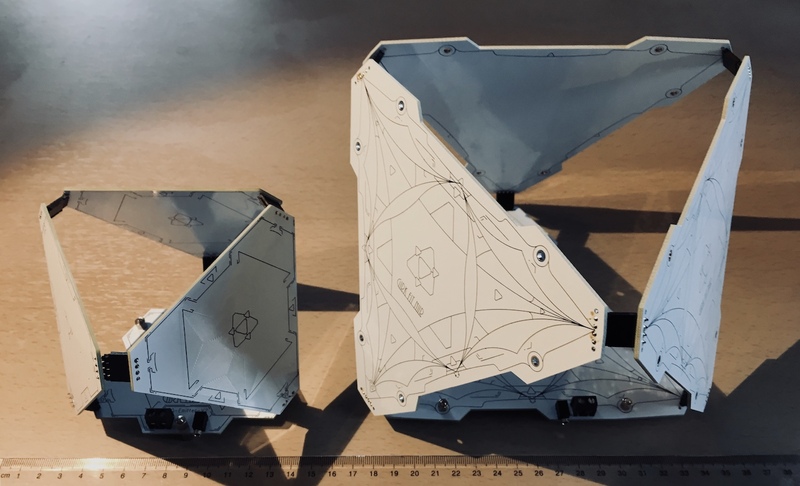 We are happy to announce that we ( a few spiritual human engineers – part of the Human Colony group ) are ready with the first tests and our prototypes are working in a very promising way. We were given DNA infusions from Girk-Fit-Niir which has given us a new way of thinking .The information we channel and the astral memories we remember , have driven us to explore and experiment with new technologies and ideas. We have 4 years of research behind us and many hours of development as our spiritual hobby development. We discovered many specific frequencies and their benefits for the human body while we tested our devices. Our devices effects are based on our observations and personal experiences. As we receive more feedback we are more and more convinced and amazed at how this tech can help us Humans. On this site we want to share the information and our work we do. In general, all coil types are suited for every kind of energy ,spiritual or mental work however ,some coil geometry does have a certain scalar pattern which affects us in some areas a lot more stronger. Every part of us has a certain energetic geometry pattern. With the the different coil types and their geometric alignments , we can affect certain areas way more intensely and for this we can create specific coils for some specific areas and purposes. The coils shapes and geometry were channeled or seen in astral memories. This is how we have access to these formations and ideas. This emitter is designed in a special way. The multiple zero point vortices on the top plate create a special harmonic interference which results in a boosted emission. This coil creates a clockwise rotating field around the coil. The coils geometric pattern accuracy is 0.02mm. 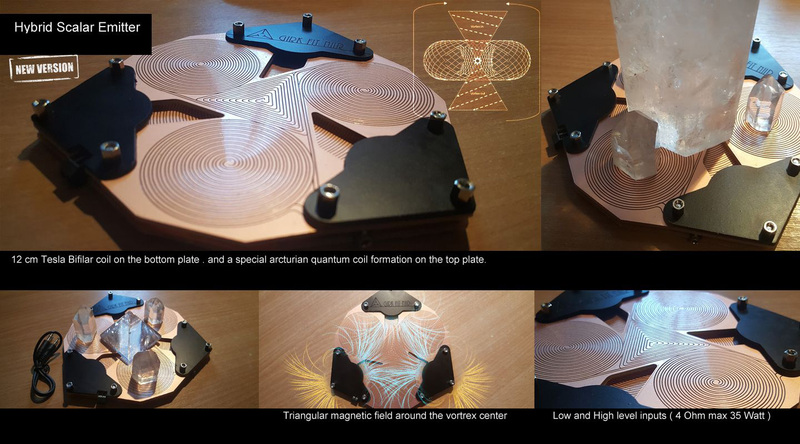 On the bottom plate there is a bifilar Tesla coil which makes a beneficial electromagnetic field. This coil provides for the body the strongest spiritual energies and also affects the body even on the physical level. This coil is perfect for healing, increasing overall health , boosting our reiki energies, balancing or charging ourselves and is excellent for channeling and communications. This coil type has the most intense effect on the overall body as it operates with multiple scalar wave patterns and electromagnetic fields. This is why it is very useful for healing, and for any kind of energetic work. 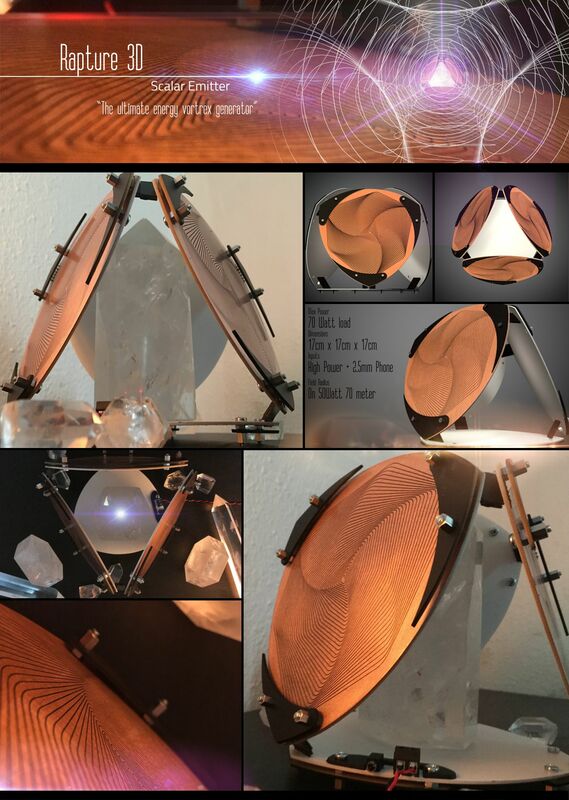 This invention is part of the new Earth reiki grid. So the more coils we have of this type on Earth,the more energy we can channel through as it creates a grid around Gaia. Every coil opens a small energetic portal, so this is beneficial for us and for the environment as long we use it with a positive and loving intention. We suggest this kind of coil for those who feel much love for Earth and for the Human collective and want to increase their personal energy level and increase their influence energetically. Since this coil boosts every part of us it is very useful for any kind of intention and spiritual development. 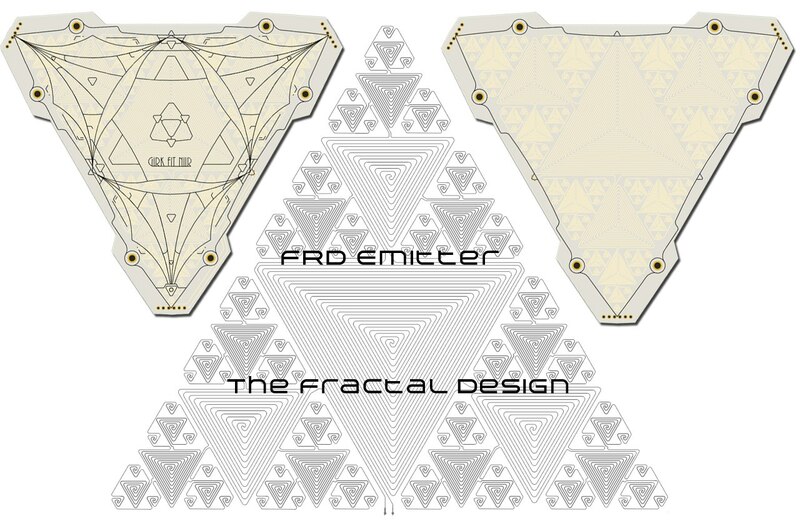 This emitter design was channeled and given by the Arcturian collective. The special kind of triangular coils and trihex coils according to the Arcturian´s, helps our mental evolution. It can increase our understandings about the universe, open new areas in our brain,increase our ability to understand higher densities and spiritual concepts , speed up our mind flow and thought processes, increase our creativity, our imagination and any kind of mental work. This has the strongest effect on the pineal gland and so far this is the most powerful for channeling and for receiving and translating any higher dimensional information that our human brains receive. The hexagonal trihex coils are generating a very beneficial scalar pattern which is in alignment with our human brain. We are using just 1-2% of our brain capacity . This kind of coil can assist us on the long term to increase this value to a higher level. Every person who uses it may experience new thought patterns and also may start getting new ideas/downloads, more easily and this coil type will help us to enjoy the exploration of our own mental and psychic abilities. Since everybody is different in mind this coil may affect every person differently and triggering different areas in their mind. This is why this coil needs more intention ,focus and awareness to work with more efficiently. This coil is not new on Earth but it was forbidden over the past decades. According to the alien information, this coil in this form existed in the Egyptian time where many alien interactions had taken place between humans and the different extraterrestrial races. The coils were way bigger in size and were being used for transportation and energetic work. We discovered that this is so far the most powerful coil we have tested. It is suited for all kind of energetic work and since it’s almost 8-10 times more strong and effective as the other coils we can suggest it for any kind of work. This coil is designed for higher power as well. It is even able to be driven with 60W sinus power. This can create a 45-55m radius field and it is very capable to make your body less dense. As you are in this field you are in a less dense energetic environment and your body will be able to integrate more 4th dimensional energy. Also it can energize your body depending on your state of being up to +30-40%. We even realized that we were overcharged so we had to deactivate the field after several uses. The coil is able to improve your sleeping pattern while using the Solfeggio frequency sequence. We realized every time we used it at a higher power we woke up 2-3 hours earlier than what is normal in our sleeping patterns. We felt very rested more than ever but we had to keep in mind that we can reach an overcharged state quickly, which is just as unfavorable as sleeping too long. We noticed the strength of this coil but so far we haven’t pointed out its specialties. We are keeping our tests running and once we understand the benefits more of this kind of coil we will update this information. We just recently developed this type of coil. We wanted to create a perfect mathematically aligned vortex generator. This coil is meant to generate a counter clockwise rotational field . This type of coil transmitting source type of energy which can be very usefully for transforming and dealing even with emotions. As this is a new type of coil the more experience we have with it the more we can share about here. 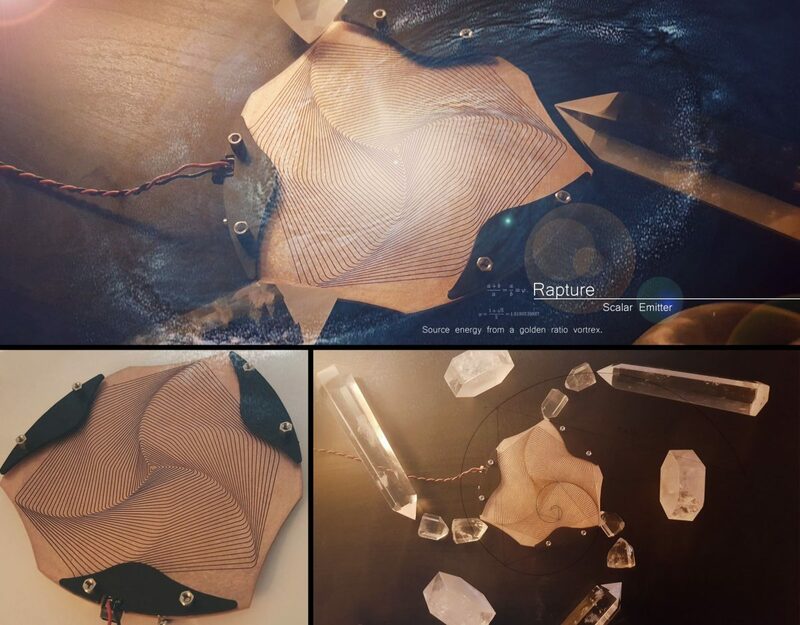 We also recently finished with the Rapture 3D Scalar Emitter Bellow you can see a couple image about it and also check out the the Vortex Simulation we created about this coil. Alone the video is very uplifting as you see how the energy fields looks like. We just recently created this type of experimental coil. 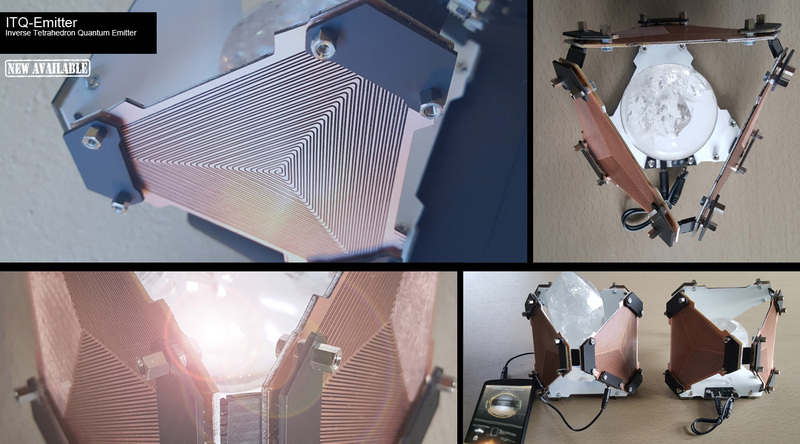 So far what we experienced is that this coil with the 12 interlocking 5D Quantum coil makes a very special effect. The coil center is a spherical Chrystal which radiate the energy outwards in between the coil plates. We used the black color as mirrors for the energy radiation inside of the coil . We looking forward to share any future test results here on this side. 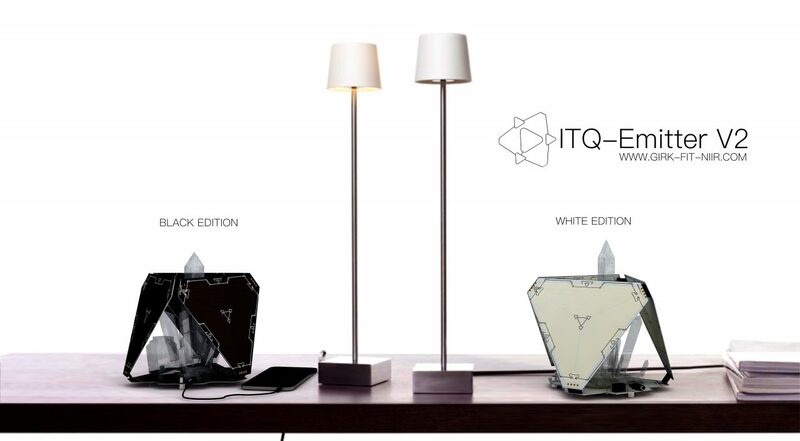 Our ITQ-Emitter V2 in action . We experimenting with a new harmonic sound library. We are using the new emitters to not just hear but to feel the vibrations and music we create. 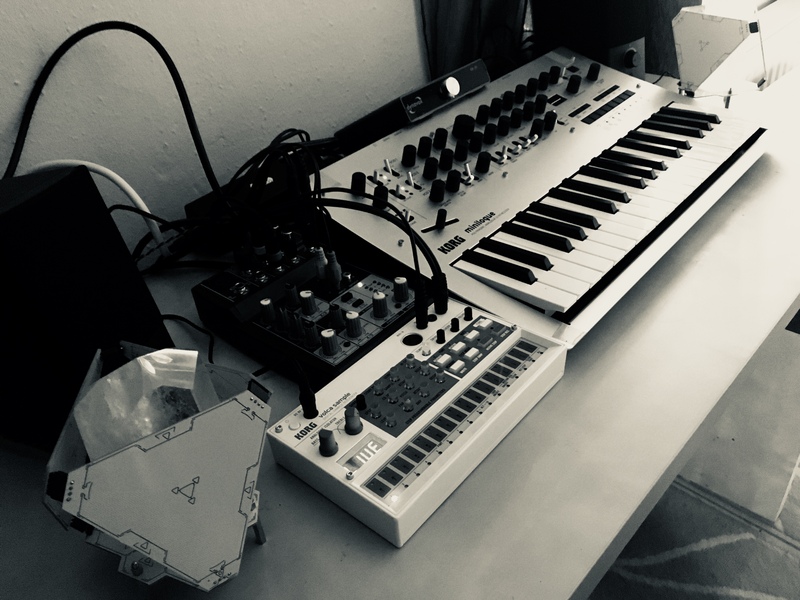 We aim to find new modulated sound samples in order to drive the coils on a new way. We drive the coils with a 20Watt Hi-Fi amplifier which is directly connected to our master output. So we play tones and music directly on the coils and we observe how the energy of the vibration affecting our body and energy. We believe this system can support any music producer in order to sense better how the music impact the body and energy. We clearly feel how different is the real A tone ( 432Hz ) and the industry A tone ( 440Hz ) . Of course the real geometrical correct A tone on 432Hz feels way better as the 440Hz. The Same system using the new FRD Coils. This is what we working on recently. We are very curious about how this type of factual coil will work. This coil contains 145 Quantum coil in a fractal design. We are looking forward to finish the plans and making some tests. Increasing and amplifying your joy and happiness and helping boost your overall vibration level. Supporting and amplifying the energetic healing processes such as Reiki and distance healing. DNA repair – We are able to realign ( with a 432 Hz /0.75mW scalar field ) the physical aspect of the DNA to its pure energetic blueprint, this helps the damaged DNA sequences recover. Helps to cure cancer ( not proved clinically yet ) – Every person who suffers with cancer needs to realign his emotional and energetic body and then it needs to heal the damaged cells. This technology can support the individuals at almost every stage. From the energetic balancing till the cells recovering. The healthy human cells are working on a current of 0.7 mW . The cancer cells are functioning on a way lower current level ( 0.2-0.35mW ). As we are using the Scalar Field on this healthy current we are able to create a field in which the Human cells become energized and charged by the field. This is very healthy for the normal cells and on a longer term too much for the cancer cells. This can help to hold the cancer back and repair/realign the DNA to its pure form. Environmental energetic emulation. Since we are aware of the Earth and rain-forest frequencies we can emulate these vibrational patterns in our home and we can feel as we would be in a forest in an energetic sense. Many testers reported cold airflow and very good feelings while the device was set on the Rainforest frequency. Increasing your dream recall. The device increases and boosts your brain synapses and creates a clearer field for your astral body . As the field boost your brain and Pineal gland you can remember and tap into significantly more of your dreams and astral trips . We had an increase of 0-3 to 5-12 dream total recall every night as we used the device at some specific frequencies. Increasing your intuition, imagination , channeling abilities , telepathic skills,and telekinesis. 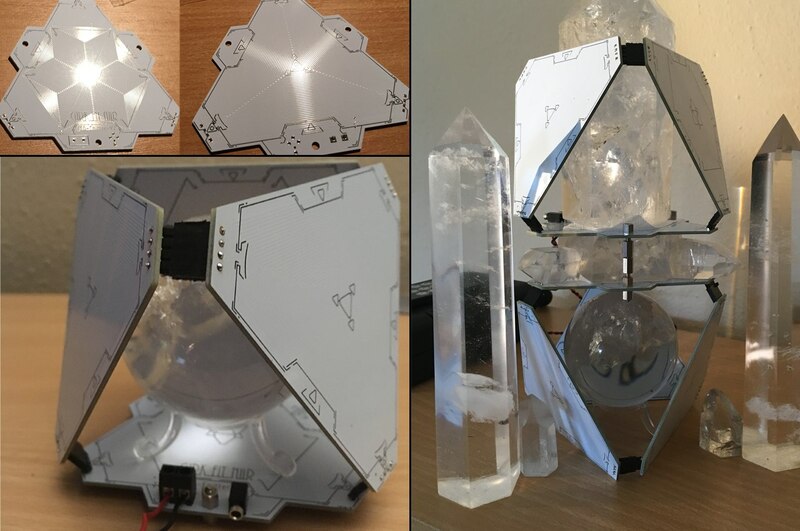 The magnetically centered and modulated scalar field ,combined with an amplified crystal grid can provide you with a multidimensional energetic field to grow your spiritual abilities and reach a higher state of mind and vibration level. This can help you greatly rediscover your forgotten spiritual abilities. Connecting peoples and groups around the globe by using the same vibration signature and creating an interconnected Scalar portal grid. 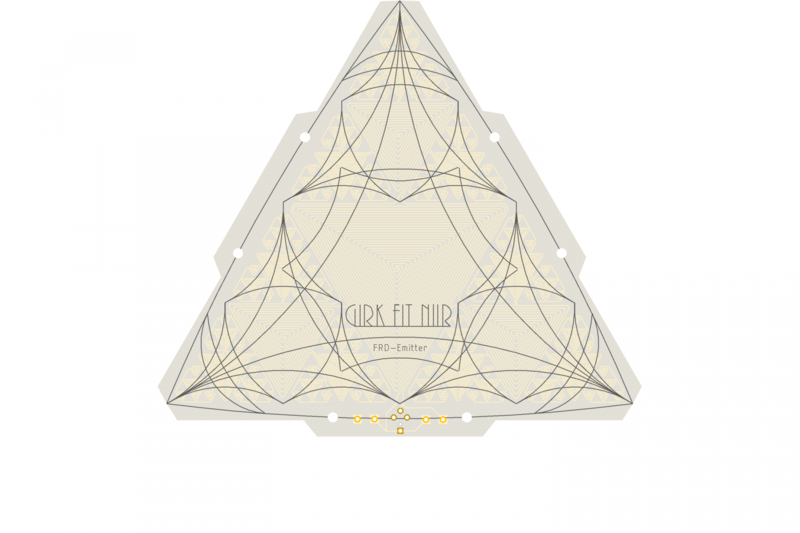 This function can be used for group meditation , group healing and connecting our energies for any purpose. We would like to use this group meditation solution for healing Gaia. Able to create the most efficient Theta field for your deep meditation. During your deep sleep state your brain frequency slows down to 6Hz. Since we can’t hear this vibration it’s hard to emulate with sound or such. With the Scalar Field we can easily create a very strong Theta field around us which allows us to go into a very deep meditative state. The Quantum Coil is capable to open portals and energy vortexes to the higher dimensions. This is very beneficial as we can use higher energies for healing and for communication. This technology is created from a combined collection of knowledge from different areas such as crystal programming, scalar fields ,energy vortex dynamics , higher dimensional energy portals and alien communications . Several times we channeled Nikola Tesla and a few other alien also who gave us some suggestions for the development and experiments. For the Human perception , the energy/crystal vortex is not visible, since it is a multidimensional phenomena. For the multidimensional beings this field is visible since their perception is way more advanced than ours. This makes it more difficult to develop and understand this technology because we cannot observe the field directly,but just with time and the side effects. This is why it is so essential to interact with friendly aliens and with advanced spirits like Nikola because they can give us some information and help while we research and test. Of course they can’t give us any deeper understandings because that would go against the Galactic rules and our own soul desire but they can slightly help and guide us on our path. The device basics: our solution combines a modulated low power scalar field which is centered and amplified by an earth magnet. This field entering into the crystal and modifies the crystal emission characteristic. This technology creates on 0.6-0.8mW signal power depending on the modulation. This creates a 1.4-2.5 meter radius field approximately in 25-35 min. The field is additive in characteristic which means it needs time to create and build up the desired energy field. The modulation and the parts together creating a very efficient and healthy field around the emitter. Once we turn off the signal ( detaching our phone ) the crystal will keep up the field for a few days if we leave it in the same position. This field among with our intention is usable for various areas of spiritual work. We are using two different coil types, one is the Tesla Bifilar coil , the other is the same coil but we wired it differently and we create a quantum vortex with the self canceling field. In the above diagram , you can see how the electrons move in the coil when we use a 5 Hz Sine signal. The two coils have the same effect in the spiritual sense but the Quantum coil is much more multidimensional and the Zero Point energy field it makes is more powerful. The Bifilar coil behaves liked a self charging capacitor as the electrons move in the inner spiral and then we reloop it with the second spiral.It becomes self charged as a result inside the coil and creates a pulse at each signal phase peak. So it is a self boosting coil. On the end of the normal coils you have less potential as in the beginning. This Bifilar coil has the same potential on both ends because of the self charging characteristic. This results in a way stronger electromagnetic field emission. Using the crystals and the magnets we amplify it and the field can spread even greater. So the Bifilar coil creates a field by itself which is beneficial for the Human body and energizes it. The Quantum Coil is actually a self canceling field. You can’t measure any electromagnetic field around the coil. This creates a Zero Point Vortex which is way more stronger and have a greater effect. In this case we use the energy to sustain an energetic fountain which allows the energies to come through. With this we create a small energetic portal and we use its radiation for the healing and such. 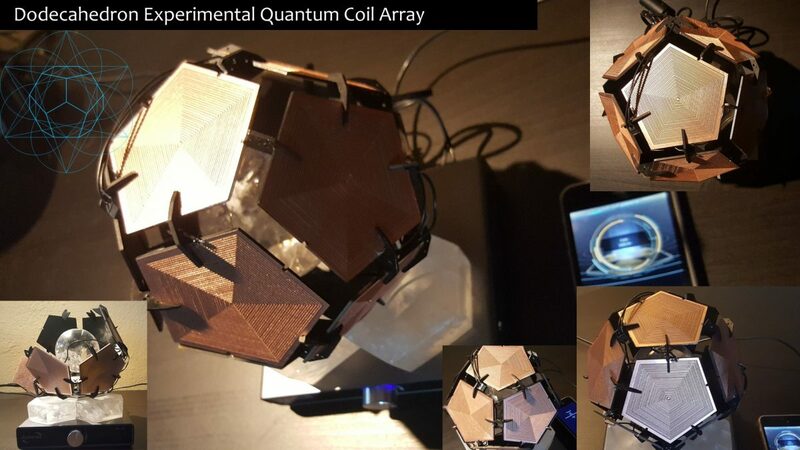 So regarding our usage the main difference is , the Bifilar coil can turn the invested energy directly into an electromagnetic field, and the Quantum coil sustains a multidimensional portal/vortex for the higher energies and the crystal filters them and spreads them. Both are beneficial but the Bifilar coil need less attention to what you do mentally and the second one is highly connected to your intention. Since this works directly with you and connects you to higher energies you need to be aware of what you do. The Bifilar coil solution has a greater effect on the physical body and the Quantum coil has a stronger effect on the spiritual / astral body. So for the more spiritual people we would suggest the Quantum coil and for those who just want to use it for health we recommend the Bifilar coil solution. If you have any more in depth questions about this technology you can connect with us via mail. Yes it is safe. Nevertheless since we are working with an amplified crystal grid and multidimensional energies we need to be aware about the proper usage. The biggest risk what we discovered, comes with high power usage ,but this public device working in the mW range, so this is perfectly safe. 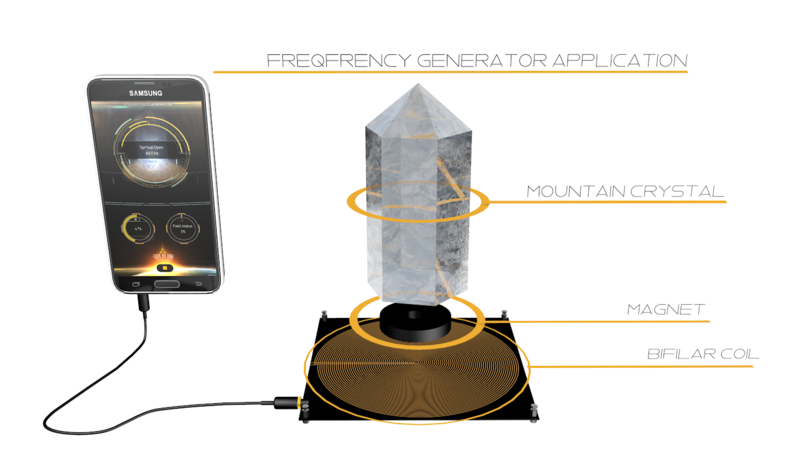 The amplified and modulated crystal grid and Scalar field have a strong effect on the human body, emotions, and energetic system. 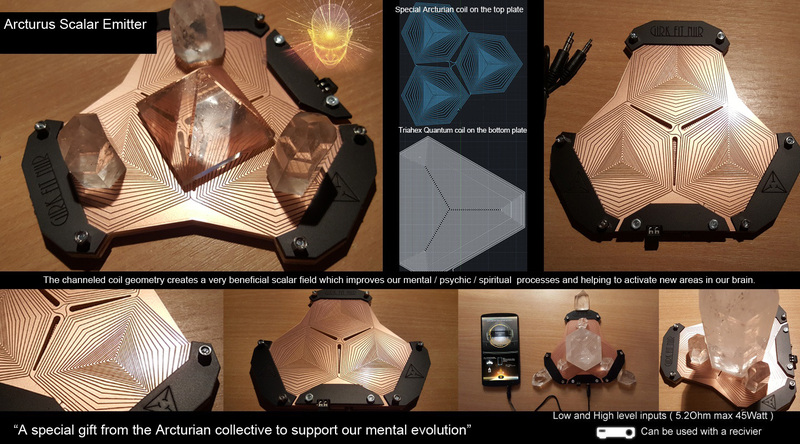 The device is capable to amplify your emotions and energies and synapses . We don’t recommend anyone to use this device while you are dealing with negative emotions or while you have a distracted mindset. The device is capable to amplify your negative feelings and thoughts too. Using this technology means you play with your own energetic system so use it wisely. We programmed in a Theta ( 6Hz ) frequency which always beneficial to come down and have a balanced mindset and emotional state. We recommend to use this first before you use any higher frequency in our application. We highly recommend to use exclusively our application to drive the coil. We provide the inspected and safe frequencies. Nevertheless you can experiment with a signal generator at your own risk. As we discovered out of 10 people 8 can sense the field on different levels 20% of them is fully aware about the field and can use it immediately and the 10% of the users can not sense anything and they might think that the emitter is not even working. We found the similar conjunctions in the EEG ( Electroencephalography ) system where you can drive a robotic arm with your brainwaves. There is 10% of the people who are not even trainable or capable to use their brain waves to move a robotic arm. Actually the scientists don’t know what the reason is behind this but we got the similar statistic from the people who use our emitters already. We have enough experience by our active users reports to say this field is beneficial on many level but also not necessarily perceptible for all of us. You can not sense the field on low energy, if so maybe just slightly ,but as you connect to it mentally and spiritually you will start to feel the presence of it. With long term usage of it , it supports any kind of healing , spiritual development, mental development as it was reported by the users . It’s like an energy source for our spiritual being. The field itself can not be measured by any ( publicly available ) human technology so all of our gathered knowledge is based on personal experiences and channeled information. We are aware that the personal experiences can be misleading and because of the possible placebo effect it can not be a real scientific proof. Also the channeled information is not necessarily convincing for anyone. On the other hand, as I previously have stated , we discovered the technology efficiency is based strongly on your own beliefs, so you can make it stronger or weaken it. We do not try to convince the skeptics about this technology. We stay with two feet on the ground and all we say is we found a new interesting area to study and experiment with and there are some promising results which make us excited to continue the research. We learned that this technology is very positively effecting the efficiency of the placebo effect. Lets call it rather the body self healing ability. This technology is in the very early phase and there is much to learn about it. As our Human mental and spiritual evolution moves forward we start to understand and sense this kind of technology more and more. If you find this technology interesting and you consider to buy one emitter, then please understand that this is new area and there is no guarantee that you would feel or sense the field at first but it will affect you positively over time for sure. Some people who have our coils said they needed more than 8 weeks spiritual work to being able to sense the field. Many alternative research point out that the Pineal Gland is the center antenna in our brain for nonphysical perception and processing. All human perception is like muscles you need to use it to strengthen up. Training this area in our brain is also essential to being able to sense the field. This can take even month´s as our users reported.